If you have happened to be around someone from Turkey during the month of May then you probably know how people of Turkey are crazy about their sour green plums. (These tart, crunchy plums dipped in salt are enjoyed as snacks or sometimes as meze with raki/arak/araq throughout the Middle East.) We talk about it--how it's so delicious with salt; pre-order overnight shipments of it; or some determined ones try to schedule trips to Turkey specifically in May. Meanwhile, almost all the Americans I know don't like these green beauties and, even worse, do not understand what the fuss is about, and I am living with one but have no complaints having all the green plums to myself. This May my thoughtful in-laws who frequent a Middle Eastern market in Arizona came across the plums below and, remembering my obsession, shipped them to me. I was very excited, of course, but whether from Arizonan heat or the trip, they were not crunchy enough to be salt worthy. I decided to cook with them. 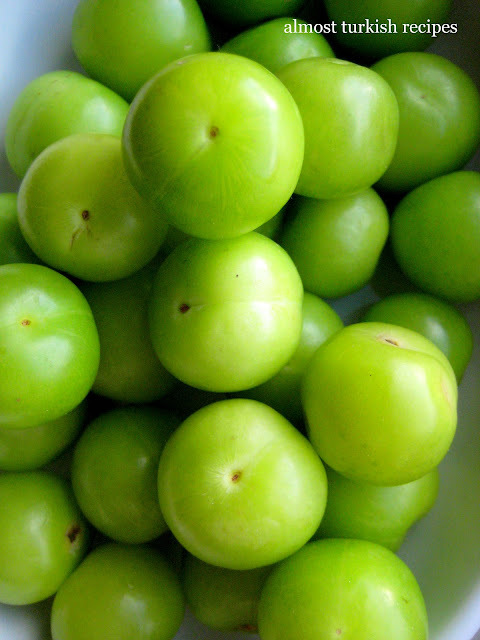 In the Western parts of Turkey, green plums are used for making compote only when they soften or turn yellow. However, in the Eastern provinces they are frequently used in meat stews for their tartness. Plums stewed with fresh garlic give an incredible flavor to beef. 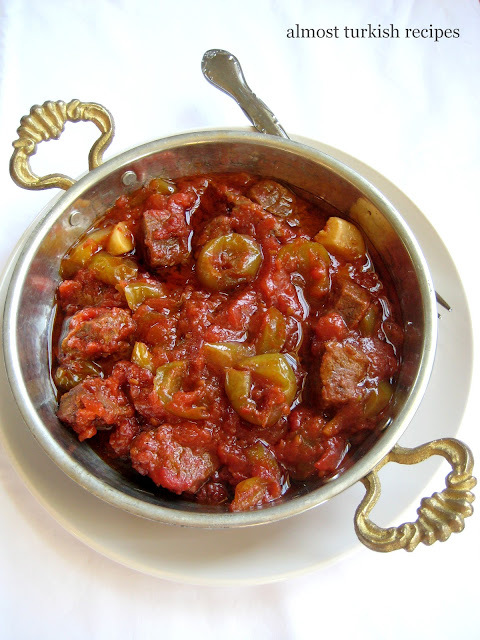 This delicious stew recipe is from Urfa and it made the American here appreciate green plums. In a bowl mix stew beef, pepper paste, tomato paste, salt, black pepper, and pepper flakes with your hand. Make sure the beef is well coated with pastes and spices. Add seeded plums, garlic cloves, and tomatoes. Place the mixture in a wide and deep oven-safe casserole or in a cast iron dish. Add boiling water to barely cover the meat ~1 cup. Cook in a preheated oven at 370F for two hours. Serve with rice and/or bread (you'll need both to soak up the divine juice). You can find green plums at Middle Eastern markets or online Turkish grocery stores. 0 Response to "Beef Stew with Tart Green Plums (Yeşil Erik Tavası)"